Dr. Brauer is board certified in both reproductive endocrinology and OB-GYN. She is experienced in all areas of infertility and minimally invasive gynecologic surgery. Dr. Brauer graduated at the top of her class from The George Washington University School of Medicine, where she was elected to the prestigious Alpha Omega Alpha medical honor society. She completed her residency in Obstetrics and Gynecology at New York Presbyterian Hospital-Weill Cornell Medical Center, during which she was recognized by the Society of Laparoendoscopic Surgery for excellence in minimally invasive surgery. 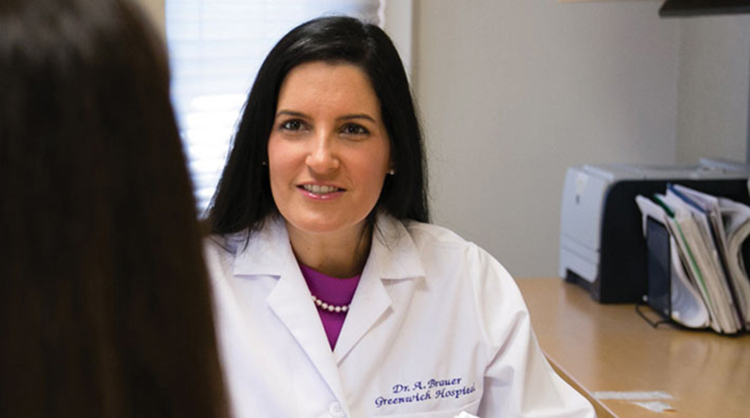 Dr. Brauer subsequently received her fellowship training in Reproductive Endocrinology and Infertility at the Ronald O. Perelman and Claudia Cohen Center for Reproductive Medicine and Infertility-Weill Cornell Medical College under the mentorship of Dr. Zev Rosenwaks. Dr. Brauer is a fellow of the American Congress of Obstetrics and Gynecology and an active member of the American Society of Reproductive Medicine and the Fertility Preservation Special Interest Group. She has presented at numerous national meetings on optimizing fertility treatments in patients with diminished ovarian reserve, polycystic ovarian syndrome, fertility preservation and complementary therapies in infertility. She is conversational in Spanish and speaks fluent Hebrew. By Anate Aelion Brauer, M.D.